My 9-year-old nephew loves to wear his cowboy pajamas, and this gave me the idea that I should organize a cowboy-themed party for him. Everything turned out great and I want to share this experience with you guys! 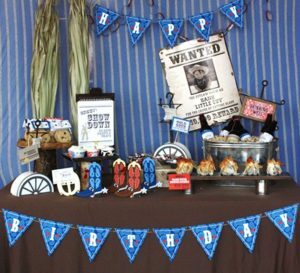 We prepared cowboy cupcakes for the guests as well as a small cake for my little nephew. We used the favor tags that came from the party package we previously bought in order to make sure that even cake and cupcakes are cowboy-themed. Did you know that a simple, checkered bandana can transform a simple kitchen table into a cowboy-style table? Well, that’s what I just did! With a couple of flower arrangements and cupcakes, everything was perfect. You can use white cardstock as well as brown construction paper to create a table runner. It looked wonderful with the contrasting white checks of the table napkin and the pop of yellow for the name of the guests. I also picked up some “Wanted” posters from our hobby store. They came in a package of 4 and I simply pasted the pictures of my nephew on them. I forgot to add, I also edited the photos and changed them to sepia color. 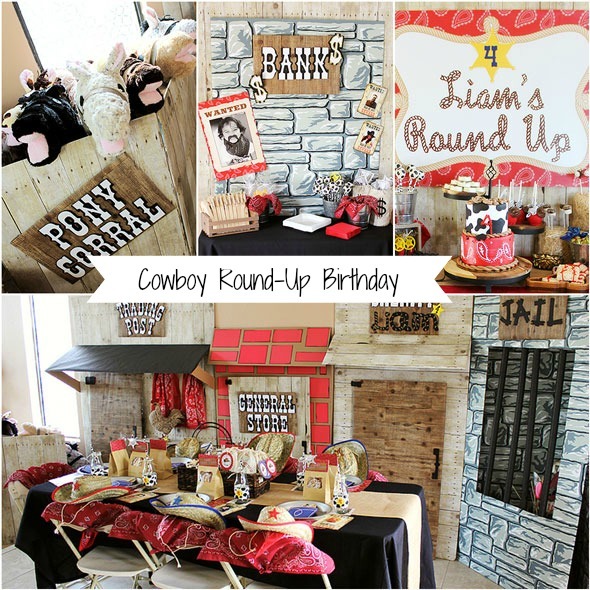 You can also decorate the birthday celebrant’s chair with red and white balloons and signs that say “Happy 9th birthday, cowboy!” It might sound quite simple, but it will really help a lot with your theme. For the party favors, you can consider creating sheriff badges for the guests using a yellow felt pasted on cardboard and cut into sheriff stars, fastened with safety pins that are glued at the back. After cupcakes and opening the presents, the last activity was the horse pinata. For this, you can buy a white horse pinata and just decorate it yourself. The kids were really thrilled when they saw this candy-filled pinata hanging on the tree and ready to be smashed! 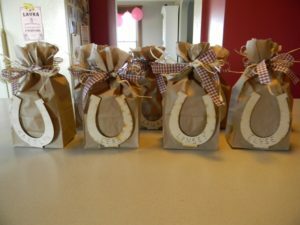 Lastly, each guest was given a ‘happy trails’ bag filled with cowboy-inspired goodies. Inside was some little plastic horse toy and trail mix. Basically, to create this loot bag, I just used brown paper bags and printed some cute cowboy tags and stapled it on the bag. Overall, it’s a fun-filled afternoon for all of us. Definitely one of the best parties I have organized. I still can’t believe that my nephew is now 9 years old. I know, I know, I say this every year, but come on, where does the time go?